Sitemap to all pages covering the state of Oregon. Photographic contributions by Alex Nitzman, Andy Field, Chris Kalina, Matt Strieby and others. Scenic areas: Columbia River Gorge National Scenic Area, Hells Canyon of the Snake River, Oregon Coast, Crater Lake National Park, Cascade Range. Geography and climate: The western third of state is fairly wet and mild with river valleys and low mountain ranges. The Cascade Range divides western and eastern portions of the state and is dotted with numerous dormant volcanoes. 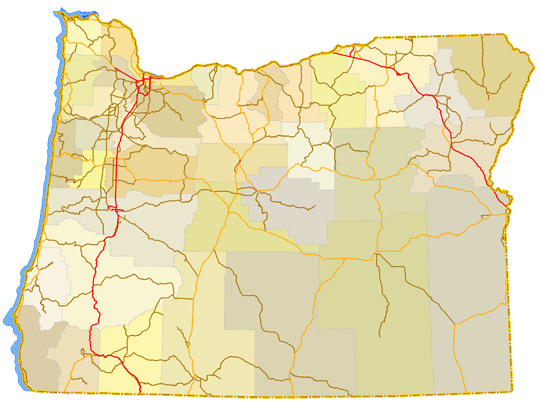 The eastern 2/3 of the state, in the rainshadow of the Cascades, is much dryer and has a more extreme climate. High plateaus and rugged mountain ranges dominate. Other interesting tidbits: All of Oregon’s beaches are public. Shoe giant Nike, Inc. is based in the Portland suburb of Beaverton. Simpson’s creator Matt Groening is from Portland and used the city’s street names for many of his characters.